Before you start working with line voltage in your electronic circuits, you need to understand a few details about how most residential and commercial buildings are wired. The following description applies only to the United States; if you’re in a different country, you’ll need to determine the standards for your country’s wiring. Standard line voltage wiring in the United States is done with plastic-sheathed cables, which usually have three conductors. This type of cable is technically called NMB cable, but most electricians refer to it using its most popular brand name, Romex. Hot: The black wire is the hot wire, which provides a 120 VAC current source. Neutral: The white wire is called the neutral wire. It provides the return path for the current provided by the hot wire. The neutral wire is connected to an earth ground. 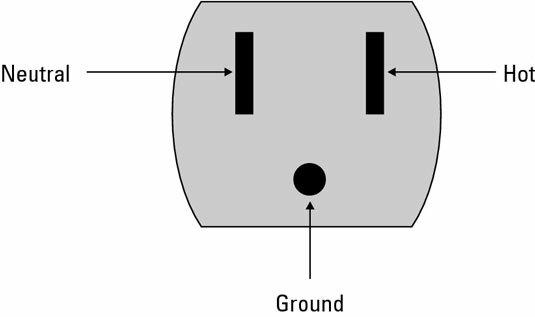 Ground: The bare wire is called the ground wire. Like the neutral wire, the ground wire is also connected to an earth ground. However, the neutral and ground wires serve two distinct purposes. The neutral wire forms a part of the live circuit along with the hot wire. In contrast, the ground wire is connected to any metal parts in an appliance such as a microwave oven or coffee pot. This is a safety feature, in case the hot or neutral wires somehow come in contact with metal parts. Connecting the metal parts to earth ground eliminates the shock hazard in the event of a short circuit. Note that some circuits require a fourth conductor. 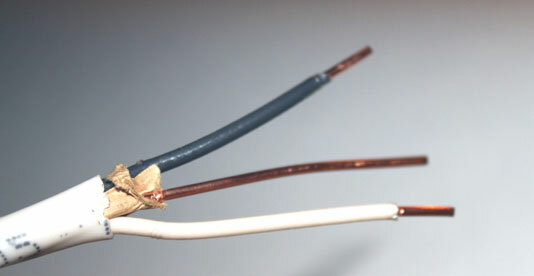 When a fourth conductor is used, it’s covered with red insulation and is also a hot wire. The three wires in a standard NMB cable are connected to the three prongs of a standard electrical outlet (properly called a receptacle). As you can see, the neutral and hot wires are connected to the two vertical prongs at the top of the receptacle (neutral on the left, hot on the right) and the ground wire is connected to the round prong at the bottom of the receptacle. You can plug a two-prong or three-prong plug into a standard three-prong receptacle. Two-prong plugs are designed for appliances that don’t require grounding. Most nongrounded appliances are double-insulated, which means that there are two layers of insulation between any live wires and any metal parts within the appliance. The first layer is the insulation on the wire itself; the second is usually in the form of a plastic case that isolates the live wiring from other metal parts. Three-prong plugs are for appliances that require the ground connection for safety. Most appliances that use a metal chassis require a separate ground connection. There is only one way to insert a three-prong plug into a three-prong receptacle. But regular two-prong plugs, which lack the ground prong, can be connected with either prong on the hot side. To prevent that from happening, the receptacles are polarized, which means that the neutral prong is wider than the hot prong. Thus, there’s only one way to plug a polarized plug into a polarized receptacle. That way, you can always keep track of which wire is hot and which is neutral. You should always place switches or fuses on the hot wire rather than on the neutral wire. That way, if the switch is open or the fuse blows, the current in the hot wire will be prevented from proceeding beyond the switch or fuse into your circuit. This minimizes any risk of shock that might occur if a wire comes loose within your project.